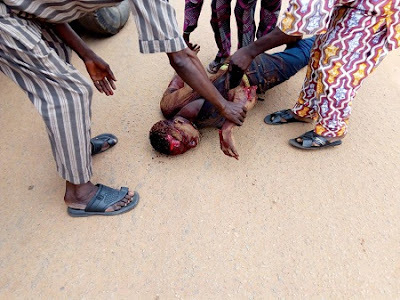 There was serious commotion yesterday after a fight broke out in the sleepy town of Ijebu-Igbo in Ijebu North Local Government Area of Ogun State leading to the death of a young man. It was gathered that the man was hacked to death by cultists. Barely a week ago, there was a bloody clash between members of a cult group and men of the Oodua Peoples Congress (OPC) in Ijebu-Igbo in which no fewer than six persons, including a police inspector, were killed. The latest incident was said to have occurred after a hot argument that ensued during a football match at LA Primary School, Oke-Agbo, in Ijebu-Igbo. It was gathered that the victim, whose identity was yet to be ascertained, was given a hot pursuit before he was hacked to death. The assailants, suspected to be members of Eiye Confraternity, were said to have fled the scene after hitting their target. “The incident happened this (Sunday) evening when some youths were playing football on the primary school field. It was during the match that a score of them engaged in a serious argument and before anyone knew what was happening, the whole place was on a rampage. “We had to run for our dear lives. It was later that we got information that one person was killed. The victim suffered deep machete cuts inflicted on him. No one had expected such killing would occur again, bearing in mind that policemen and other security operatives had been deployed in the town about a week ago,” said a source.